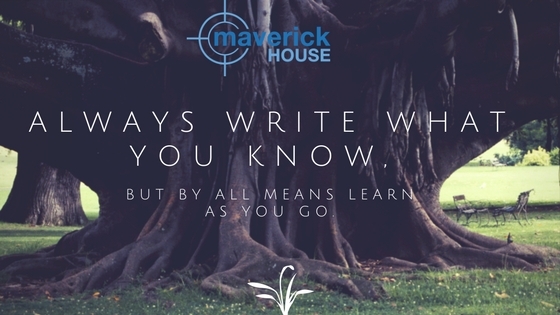 Write what you know is what we’re constantly advised as writers and you have only to look at the Maverick stable of authors to see that put into practise. Even fiction is heavily reliant on fact and real-life experience, otherwise it wouldn’t work. As I have worked all my life with racehorses and write mainly horse-racing thrillers I guess I should verify that. But, to be honest, I’ve never considered it – nor let it stop me from learning something new to write about. Isn’t that what creative writing and fiction is all about? Escapism from our everyday lives; well, for the reader, anyway. For the writer, the success of the reader’s escape very much depends on the reality of the world created. One flaw and it falls apart. Of course you must write what you know, and only what you know, but never let that stop you from learning as you go. “I’m researching for my next novel” is a phrase you’ll likely hear from many writers. They didn’t know their chosen subject when they started, but they sure do now. When I write about horseracing, elements of the plot create themselves. The natural biorhythm of the sport sets the ticking bombs and cocked guns in place. Had I needed to research it, I’m sure I would have noticed the same points and still made the same use of them. Would my research have been that deep? I hope so, or why bother? Upon reflection, both answers were correct. If you write what you know, or in my case live and breath, then the research is already done for you, years of experience serving as a reference library. All the best espionage thrillers were written by former spies, after all. But if that’s a genre you love, there’s nothing stopping you from writing an espionage novel too. Isn’t it a world you’re already familiar with thanks to all those books? Of course, had the readers asked me how long my first published novel took to research I would have understood the question and fired back, “six years.” Six years to research and four to write it, surrounded throughout by copious hand-written notebooks, three or four open at once as I collated the material and transported myself back to first century Rome. And yes, I recognised and used those same cadences and nuances I found in the daily life of ancient Rome to aid the plot, just as I had naturally used my horseracing experience. Did I write what I know? Eventually! An initial interest created a spark and then I set out to learn. The Roman world I created for my readers is as flawless as the racing world I know so well, thanks to meticulous research. If in doubt, leave it out. Always be 100% sure of your facts, because one slip will shatter the illusion. Readers want to be transported into the world of a book and authors have a moral obligation not to disappoint, however much work that takes. No short cuts – check, check and double check. Was a glimpse of stocking ever really looked upon as something shocking, or should we be more careful in what we take as gospel? We’ve all heard about Nero fiddling while Rome burned, right? Wrong. It never happened and while I could have borrowed popular myth to add colour to my novel, I wouldn’t have dared do so. Laziness is never a virtue. One reader would be sure to spot an error and be turned off by it. As authors we need to have the ethics of a shepherd and not lose any. Everyone thought the world was flat, a long time ago. Actually, no one ever thought that before Washington Irving added the notion into his 1828 biography of Christopher Columbus, a whimsical piece of poetic licence to add drama to the story. Since 1828 we have thought that everyone once thought the world was flat! So you see, as authors we do have a responsibility to our readers. And so, having considered it, I have to agree – always write what you know, but by all means learn as you go. Just be sure to view your completed novel as your exam paper and take great care to pass.